Job Position: Assistant Manager, Junior Engineer, Maintainer etc..
Age: Upper age limit as on 01.01.2018 is 28 years and age relaxation is applicable as per rule. For Executive cadre posts, viz., under SECTION ‘A’ & ‘C’ (for post codes RE01 to RE07 and CE01 to CE04), the selection methodology will comprise a threestage process –CBT (two papers), Group Discussion & Personal Interview followed by Medical Examination in Executive(Technical/Non-technical) category, as the case may be. For Non- Executive posts, viz. under SECTION ‘B’ & ‘D’ (for post codes RNE01 to RNE09 & CNE01 to CNE05), the selection methodology will comprise a twostage process – CBT (two papers), followed by Medical Examination in prescribed medical standard & for Maintainers posts under, viz., RNE10 to RNE13, the selection methodology will comprise a two-stage process – CBT (One paper), followed by Medical Examination in prescribed medical standard. The selection process would judge different facets of knowledge, skills, comprehension, aptitude and physical fitness. Candidates will have to pass through each stage successfully (including Medical examination), before being adjudged as suitable for selection. Candidates, who fail in the prescribed medical test, will not be offered any alternative employment and decision of the Corporation shall be final on this issue. 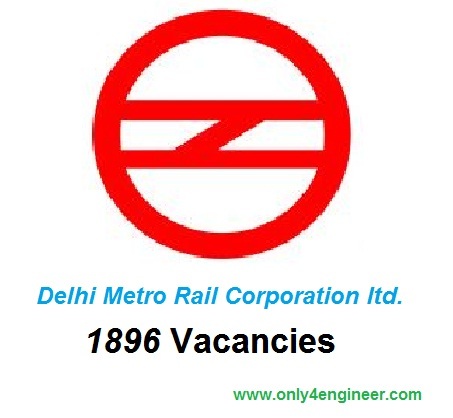 Dates of CBT examination, result and all recruitment related information shall be available only on Web site: http://www.delhimetrorail.com and candidates must remain in constant touch with it. Computer Based Test (CBT): The CBT will consist of two papers (Paper-I and Paper-II, to be held on the same day at the same centre). Paper-I will consist of multiple-choice objective type questions, bilingual (Hindi/English), on General Awareness, General Intelligence & Reasoning, Quantitative Aptitude (General English for Maintainer-Electrician, Electronic Mechanic, Fitter and Ref & AC Mechanic) and/ knowledge of the discipline/trade. There will be a total of 120 questions, each carrying equal marks. There will be negative marking. For every wrong answer 1 /3 marks will be deducted. The Paper-I shall be of 1.5 hours duration. Paper-II (Not for Maintainers post, viz., from RNE10 to RNE13) will consist of objective type questions on General English to judge the knowledge of English language. There will be a total of 60 questions, each carrying equal marks. There will be negative marking. For every wrong answer 1 /3 marks will be deducted. The Paper-II shall be of 45 minutes’ duration. Candidates who qualify separately in Paper-I & Paper-II and rank high on the merit list within the zone of consideration in (Both Paper-I & Paper-II separately) as decided by DMRC shall be called, based on the overall merit of CBT(both Paper-I & Paper-II together), category wise, for Medical Examination/GD & Interview, at Delhi/NCR. Candidates (for all categories of posts) called for GD & Interview, shall be paid to & fro sleeper class Railway fare for journey by the shortest route between Railway Station nearest to hometown & Delhi. NOTE:- Normalization method will be applicable for evaluating CBT results, where the CBT is held in more than one shift. Medical Examination: All candidates shall have to undergo the medical fitness test(s) and meet the medical standards prescribed by DMRC for various posts. Expenses for the first time medical examination of the candidate will be borne by DMRC. However, in case a candidate seeks extension for joining or re-examination, subject to extant rules, then for the second time medical examination/re-examination, if need so arises, the expenditure for the medical test/s will be borne by the candidate himself/herself. Candidates having undergone lasik surgery are not suitable for any posts except Asstt.Programmer,Office Asstt.,Store Asstt and Legal Asstt.. Character & Antecedents: The success in the examination does not confer any right to appointment unless the corporation is satisfied after such an inquiry, as may be considered necessary, that the candidate having regard to his/her character and antecedents is suitable in all respects for appointment to the service. It will be the responsibility of the employee that his/her, character and antecedents, is done in time. Application Fees: : UR and OBC candidates have to pay Rs. 500/- and Rs. 250/- for SC/ST/PWD and Women candidates through online or Net banking.